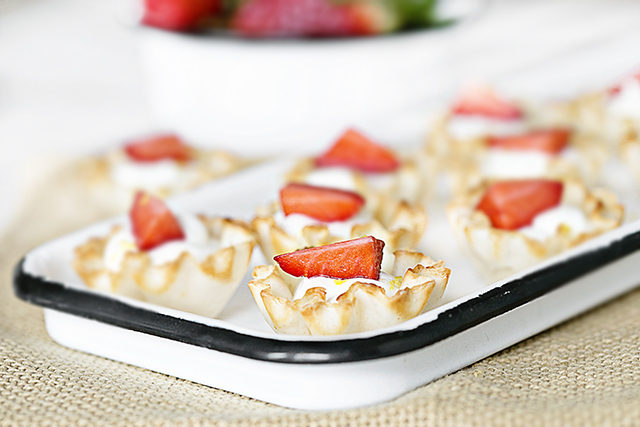 Bake mini phyllo shells according to package, if necessary. In a medium bowl, briskly whisk together softened cream cheese, yogurt, sugar, lemon juice, 1 tsp. lemon zest and vanilla until smooth. Spoon cream cheese mixture into a plastic ziploc bag, snip off a corner and evenly pipe mixture into mini phyllo shells. (Filling shells with a spoon is an option as well). Top each shell with a piece of strawberry or fruit of choice (raspberries, blueberries or blackberries). Garnish with additional lemon zest. Yields 1 tart per serving.